Taco Bell has released the official trailer for the sequel to its Web of Fries film, titled “Web of Fries II: Franchise Wars,” to inform that Nacho Fries are back and so are the sinister “Burger People”, who will stop at nothing to protect their salt-and-ketchup monopoly. 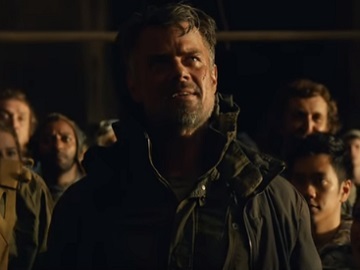 The 60-second promo, developed in collaboration with Deutsch, features a future society ruled by the villainous Big Fry corporation, which is trying to hide the truth from the public about nacho fries, and Clara, Josh Duhamel’s now grown-up daughter, who is set out to exact revenge on those responsible for her father’s disappearance. “Big Fry took everything from me to keep my father from exposing the truth about Nacho Fries”, Clara is heard saying while she’s seen looking at a photograph of her as a child and her dad. “Their fight is about protecting their business, my fight is personal,” she’s also heard saying. When a homeless man asks her, after eating some Nacho Fries, if there is something better than them, Clara answers “Revenge” and sets out on a dangerous mission, which might end bad for her. Luckily, her father shows up just in time, shouting “I’m back! For a limited time!”. At the end of the trailer, it is informed that the Nacho Fries are back. The nation’s leading Mexican-inspired quick service restaurant originally released Nacho Fries in the spring but has brought them back for a limited time due to popular demand. The interesting part is that this fake trailer for a fake movie pays homage to a real movie’s 25th anniversary.